Historical tensions between Nigeria's pastoralist Fulani and settled indigenous farmers have intensified in recent years, with dwindling natural resources and land availability greatly contributing to the ongoing, escalating conflict in the north of the country. The urgent requirement to engage with, rather than isolate, Nigeria's Fulani from various socioeconomic and environmental management strategies is fundamental to peace and agricultural productivity in the region. This requires a greater understanding of formal and informal governance mechanisms and their relative impact on the Fulani. This study examines the existing and potential roles of various actors within the transhumant Fulani community of the Kachia Grazing Reserve in Nigeria's Kaduna State, triangulated with views from external public and private sector representatives. The findings reveal three main spheres of governance that intertwine and impact on the largely self-organising Fulani: religious or customary laws overseen by the imams, ‘informal’ laws of the community overseen by Fulani civil leaders and the ‘formal’ laws outlined in the official policies of the state. In addition, peripheral entities such as Fulani co-operatives, non-governmental organisations and the private sector can have considerable influence. The health and husbandry of livestock was identified as a key motivator for successful self-governance, integral to Fulani daily life. Understanding and appreciating the self-governance structures of the Fulani, particularly given their current isolation from formal state policy processes, can help identify motivators and opportunities for dialogue between the Fulani and various external actors. Improved veterinary service provision and livestock extension services are potentially powerful entry points for both the public and private sectors alike. Nigeria's Fulani pastoralists are thought to number around 12 million, accounting for a quarter of sub-Saharan Africa's 50 million pastoralist people (Ibrahim ; Rass ). Thousands of Nigerians make a daily living from the sale, transport, processing and marketing of Fulani livestock products, including meat, milk, skins and draught power, adding substantial value to Nigeria's livestock subsector. In the capital Abuja alone, 4,000 goats and 400 cattle - largely supplied by the Fulani in northern states - are slaughtered every day (informant interview, Federal Capital Territory (FCT) of Abuja). Some suggest that the Nigerian cattle industry generates only 6.8 billion USD of a potential 20 billion USD annually (PARE ; Bénard et al. ). The national status of Nigeria's Fulani pastoralists has changed dramatically in the last century, from perceived ‘favouritism’ by the British to shouldering the blame for an underperforming livestock sector and destabilisation of security in Nigeria's northern states by more recent regimes (HRW ). Despite the huge potential to formalise their share of the livestock market supply chains in Nigeria and across West Africa, the Fulani remain at the periphery of most formal networks. This is largely due to isolation from, and poor communication with, various external actor networks that could deliver the required services and resources to improve integration with wider Nigerian society. Social, political and economic marginalisation remains a cornerstone of the majority of contemporary analyses on pastoralist societies across the world, with investment into pastoralist development generally regarded as ‘disproportionate’ to its potential role in national economies (Rass ; Davies and Hatfield ). Despite attempts to promote greater policy and development innovations to address pastoralist issues, pastoralism is still perceived in a negative light by national governments and global policy actors alike (Nori et al. ; Barrow et al. ). With policy approaches ranging from sedentarisation to the promotion of political inclusion, ongoing issues regarding service provision, land rights and political marginalisation consistently feature as limitations to pastoralist livelihoods in the twenty-first century (Davies and Hatfield ; Nori et al. ; IUCN ; Nouakchott Declaration on Pastoralism ). The situation in Nigeria is no exception, with one author noting `every attempt to bring Nigeria's Fulani into the fold of so-called progressive society has failed, leaving the Fulani at the mercy of the weather and faulty government actions that impoverish rather than promote the welfare of the pastoral producers’ (Iro ). However, in an increasingly globalised world, now is a critical time to engage with pastoralist communities and understand their current - and potential - contribution to society; not just to the agriculture sector but to wider national and regional economic performance and security. Given the right inputs, pastoralism offers an opportunity to expand livestock production for regional markets, sustainably manage rangeland ecosystems increasingly affected by climate change and stabilise conflicting geopolitical interests, most strikingly evident in the growing uptake of arms by pastoralist youths that have become available as a result of various sequelae to the west's `War on Terror’ and the Arab Spring (OECD ). The growing importance of understanding informal governance mechanisms and decision-making processes `rooted in day-to-day, ground level realities’ (Jones ) in pastoralist communities cannot be overestimated. There have been several pastoral development interventions in Nigeria over the years, geared towards education, sedentarisation, livestock health and productivity (Ibrahim ; Oxby ; Waters-Bayer and Bayer ). They have had little impact however, since the conditions of pastoralists remain largely unchanged. This high rate of failure can be attributed to misconceptions of decision-makers regarding pastoralist natural resource management via informal governance systems, with policy analysts `underestimating the potential for self-organisation’ of these pastoral communities (Ibrahim ; Jones ; Ostrom ; Nori et al. ). In this way, the ongoing pastoralism debate is not unlike that which occurs in various other social-ecological systems (SES) governed by traditional societies, where `simple blueprint policies do not work’ (Ostrom ). Identifying and analysing the self-governance mechanisms of local communities has been acknowledged as a `core challenge in diagnosing why some SESs are sustainable whereas others collapse’ (Ostrom ). The ability to `get organised’ has been highlighted as key to enabling pastoralists to gain a stake in the policy process, particularly concerning land rights (Nori et al. ). Understanding the mechanisms of pastoralist self-organisation and informal governance structures, particularly in light of insufficient resource inputs from state authorities, remains a critical component of the pastoralist development process. This paper contributes to the existing knowledge base on the broad area of Fulani social organisation, particularly regarding the role of government policy, self-governance and the interactions between the two. The research on which this paper is based was carried out over three separate visits to Kachia Grazing Reserve (KGR) in two years under the European Commission Seventh Framework project Integrated Control of Neglected Zoonoses (ICONZ) project, and the UK's Biotechnology and Biological Sciences Research Council (BBSRC) under the `Combating Infectious Diseases in Livestock for International Development’ (CIDLID) scheme. The main objective of this research was to understand the major actor networks that govern Fulani pastoralists, and the influence - if any - of external actors such as state government, donors and the private sector. Fulani pastoralists are thought to have arrived in Nigeria around the thirteenth or fourteenth century, migrating east from the Senegambia region (Blench ; de St Croix ). Historically, the Fulani have a long association with politics, scholarship and wealth; a sedentary urban class of religious scholars was well established by the early nineteenth century. It was around this time that Usman dan Fodio led a jihad to conquer most of northern Nigeria (Nwabara ), forming the Sokoto Caliphate. The integration of the Fulani with the Hausa ruling systems in the Sokoto Caliphate permanently differentiated the urban `Hausa-Fulani’ from the more marginalised, pastoralist Fulani (Azarya ). The Sokoto Caliphate was the largest African state south of the Sahara at the time, with land tenure organised according to Islamic inheritance law (Ezeomah ). By the early twentieth century however, all land in northern Nigeria become state-owned under British colonial rule, with application for land rights for farming or grazing requiring government approval. Accounts of Fulani pastoralists moving southwards into Nigeria's sub-humid `Middle Belt’ zone appear as early as the 1820s; however, tsetse flies and the associated trypanosomiasis disease necessitated a return northwards into the semi-arid zone during the rainy season (Blench ). This gradual southern movement has been attributed to the creation of dairy markets by Hausa traders and the relative security of the British colonial period, when violence related to the trans-Saharan slave trade was curtailed (Blench ; Waters-Bayer and Bayer ). Migration was also seen as a way to avoid the hated jangali (cattle tax) imposed by the British (Waters-Bayer and Bayer ), with the introduction of trypanocidal drugs further enabling pastoralist cattle herds to access the high-quality grazing land in the southern sub-humid zone (Blench ). There has also been movement in the opposite direction: northwards expansion of agricultural cultivation into the semi-arid zone occurred from the 1960s, alongside a general increase in the amount of land under cultivation in the region. The resulting gradual disintegration of the burtali (official stock migration routes) allowed indigenous farmers to claim ownership rights to fertile land and waterways which Fulani cattle had been grazing for over two centuries (Blench ). The situation was exacerbated by the 1978 Nigerian Land Use Decree which gave complete authority to the state and local governments to assign and lease land. The relative ease with which settled farmers could obtain the `certificate of occupancy’ demonstrating land ownership, due to their `indigene status’ and higher literacy levels, left the Fulani in Nigeria `permanently on the outside of land tenure’ (Ezeomah ). Contributing to the complexity regarding land ownership is the observed reluctance of the Fulani to buy land even when the opportunity exists. The idea of `outright ownership’ of natural resources is met with suspicion by many pastoralist groups, whose social structure functions around common land use; there are known cases where Fulani households have been leasing the land their houses are built on for decades (A. Majekodunmi, personal observations). Several mechanisms for addressing the growing issues of land use in northern and central Nigeria have included the mapping and demarcation of cattle routes and the ongoing promotion of grazing reserve establishment (Adebowale ; Buhari ; IRIN ). However, despite numerous attempts by both government and international organisations to improve the land rights situation, rising tensions in northern Nigeria have resulted in `horrific internecine violence’ (HRW ) over the last 20 years. Kaduna and Plateau States - the sites of this research - have been the worst affected, with over 10,000 deaths since 2010 (HRW , ). Although largely attributed in the press to religious conflict between the indigene Christians and non-indigene Muslims (HRW , ), there are many who believe that tensions are purely economic in nature (Abbass ; A. Okello, personal communication). Calls are gaining momentum for the government to `end the rhetoric’ and take concrete legislative steps to address the `policy and legal vacuum’ that is exacerbating the conflict between pastoralists and crop producers (Ibrahim ; PARE ; Adebayo and Olaniyi ). Others believe that the current levels of `tribal, religious and political polarisation’ are overwhelming any efforts to promote peace in central Nigeria, with the view that `sadly, any hope of government intervention or fair reviews of land tenure and natural resource use laws is unlikely’ (Majekodunmi ). The Nigerian Grazing Reserve Act of 1964 was passed as an initial attempt to improve Fulani access to grazing land for their cattle, simultaneously encouraging sedentarisation in order to address existing conflicts between farming and grazing communities and improve provision of essential amenities to pastoralist families (Ibrahim ). In a broader sense, it was expected that the policy would help address some of the wider constraints facing livestock development in Nigeria at the time, such as disease control and market supply (Ingawa et al. ). Following this, the National Agricultural Policy of 1988 declared that a minimum of 10% of the national territory, equivalent to 9.8 million acres, would be allocated for the development of grazing reserves in an attempt to protect pastoralism (Ibrahim ; CIEL ). However, this policy has not been enforced; to date, only 2.82 million hectares has been acquired in a total of 313 reserves (Ibrahim ; CIEL ). Additionally, it appears that only around 24 of these reserves are formally gazetted by the government, meaning that occupants of the remaining non-gazetted reserves do not have the rights to services such as road access and water provision, as set out in the grazing reserve laws (Kaufmann et al. ). Whilst establishing grazing reserves could certainly help alleviate the ongoing land conflicts, their increased promotion may merely be seen as an `admission that all efforts towards peaceful coexistence of farmers and herders has failed’, fostering stereotypes and further suspicion amongst the Fulani and indigenous ethnic groups (Majekodunmi ). Kachia Grazing Reserve (KGR) was one of the earliest reserves established by the Nigerian government under pastoralist settlement schemes in the 1960s (Kaufmann et al. ). KGR is a gazetted reserve situated in Kaduna State in northern Nigeria, covering an area of 31,000 ha divided into six geographically distinct administrative blocks. The reserve lies within the West African sub-humid zone with a rainfall of 900 to 1,500 mm/year (Oxby ; Kaufmann et al. ). The area was declared tsetse-free after a successful spray programme in 1967 (Oxby ), but tsetse flies have reinvaded and remain a serious problem to both human and animal health on the reserve (Majekodunmi et al. ). In the early years of KGR, livestock production inputs such as a farmer service centre, boreholes, health services and legume fodder banks were provided by the International Livestock Centre for Africa (ILCA) (Kaufmann et al. ). By 1981, 12 families had settled, with the KGR deemed `advanced in comparison’ to other reserves in Nigeria at the time (Oxby ). The reserve currently has a population of 5,252 people, distributed amongst 581 households over the six administrative blocks. Despite being officially `settled’, the majority of these Fulani are transhumant, taking their cattle off the reserve to graze elsewhere during the dry season. Of the 581 households on the reserve, 569 own cattle, currently estimated to be 23,327, with around 5,914 sheep, 5,058 goats and 123 donkeys (ICONZ ). Despite these livestock numbers, there is no permanent veterinarian on the reserve, although two slaughter slabs exist. The prevalence of most diseases is largely unknown, although animal brucellosis has an estimated prevalence of 8.6%, whilst other studies have found the prevalence of bovine trypanosomiasis and geohelminth infections to be 8.4% and 53.8%, respectively (Enwezor et al. ; ICONZ ; Nnabuife et al. ). A combined qualitative research approach consisting of focus group discussions (FGDs), semi-structured interviews and field observation was taken to map the various relationships and hierarchies that existed on the reserve. A total of nine FGDs were held with community members from the various blocks, stratified according to age and gender (Table 1). Interviews normally lasted between one and two hours and were undertaken in Hausa and Fulfulde, covering a broad range of topics around Fulani cultural issues and practices, knowledge and control of both human and animal disease, and various governance systems and actors. A visit to the local school was conducted and several teachers interviewed, along with individual interviews with the heads of four of the six administrative blocks. Several leaders of both male and female co-operatives were also interviewed, as well as the resident community medical doctor. Representatives from external bodies such as the state and federal government, private veterinary sector and research organisations were also interviewed in order to triangulate or `cross check’ the accounts and individual views of the KGR Fulani. Verbal consent was obtained prior to all interviews, which were taped and translated at the end of every day. Transcripts were entered into Microsoft Word 2010 and manually coded. Empirical accounts of KGR's history and establishment are varied, with the younger Fulani appearing in general to be much less informed of the processes which led to the KGR development in the 1970s; `we have never asked about it, not even once’ (female FGD participant, aged 16). Seemingly romanticised accounts from some of the younger respondents described how Sardauna of Sokoto Sir Ahmadu Bello (the prominent Nigerian politician and premier of northern Nigeria from 1954 until his assassination in 1966) `asked us to come here’ and `called our head men to this place’ (male FGD participants 24, 25). However, some of the original inhabitants of the reserve indicated that they moved here due to the increasing land pressures in the sub-humid zone at the time, as it provided them with an opportunity to live in relative peace with their cattle; `in the rainy season you hardly found a place to tie your cattle where we came from, so we came here [to KGR] to look for food for ourselves and our animals’ (male FGD participant, aged 73). Several of the more politically connected male co-operative leaders are quite clear about the Nigerian government's sedentarisation policies being implemented at the time: `the federal government said there is no way to help Fulani people unless they come into the reserve....if you are based in this place nobody will come to disturb you’ (interview, male co-operative leader Nagge Beldum Sappo [name means `10 important cows’]). Despite the objective of the 1964 Grazing Reserve Act to settle `nomadic’ pastoralists, it appears that the majority of original KGR residents were transhumant Fulani from neighbouring Local Government Authorities (LGAs). `We were the indigenes of this place since from the beginning, we used to go out of this place for about a year but we didn't go out from our district’ (informant interview, Ardo Block 1). Kaufmann et al. () found that all inhabitants of the KGR at the time were `Kachichere Fulani who have been resident in southern Kaduna State for generations’. In recent years however, due to the rising tensions in the region, residents are increasingly coming from further away, including Plateau, Bauchi, Nassarawa and Kano States in the north and east of the country (M. Ducrotoy, 2012, unpublished data). By all accounts, life on KGR was difficult in the early years of its establishment, reflecting published descriptions of land allocated for grazing reserves as areas `previously avoided for sound ecological reasons’ (Ingawa et al. ). Many of the older Fulani interviewed confirmed that the land given to them was thick bush, with no road access, no water and a large variety of wildlife including `elephants, buffalo and lions - and a big snake that used to swallow people’ (female FGD participant, aged 65); it is little wonder the Fulfulde name given to KGR by the original occupants is Ladduga, meaning `wilderness’. Several older participants clearly remember the amount of flies on the reserve in the early days, drawn by the uncleared land; `if you were moving around you had to carry a leaf to protect yourself from flies biting, but now the place is OK, you can even come with your sleeping mat outside’ (female FGD participant, aged 67). In a pertinent example of the central role of cattle to the Fulani psyche, the human health impacts of flies such as sleeping sickness and trachoma were deemed insignificant compared to their effects on the cattle at the time; `because of the flies there was blood on the body of our cattle, and after this you will see tears coming out of their eyes and they will fall sick’ (male FGD participant, aged 64). Respondents reported that the situation became so severe in the wet season that they were forced to move their cattle off the reserve; relevant literature implies this may have resulted in tension with nearby settled farmers at the time, as a result of crop destruction (Ingawa et al. ). Despite the early challenges, many described their `peaceful life’ and pride at how Ladduga is developing to date. Feelings of safety and security associated with life on the reserve were apparent, possibly reflecting the conflicts some may have recently faced before arriving on the reserve; `no-one can come and enter your house and claim that it is their house; where you fence your house - that is yours’ (male FGD participant, aged 36). Field observations and interviews held on the reserve for this research concur with previous accounts of the `institutionalised political leadership’ that occurs within Fulani society (Iro ; Riesman ). The hierarchy on the reserve consists of the much-respected Imam who governs according to Shari'a law, followed by the Ardo, a group consisting of the District Head and the leaders of the six geographically distinct KGR administrative regions known as blocks or wards. In many ways, the KGR Ardo still fulfil their historical role as mediators between the Fulani community and government authorities, although the leaders of the male co-operative groups are also active at the local government level. When asked about their role, one Ardo likened it to `what the village heads of the world are doing’.our role is to see the development of Ladduga, and promote peace’ (interview, Ardo ward 4). Many respondents indicated that their behaviour, particularly in terms of their interaction with `strangers’ from outside the reserve, depended on what these traditional leaders told them to do. This appeared heavily enforced, for example if visitors did not have permission from the hierarchy to speak to the Fulani, no one would turn up to the meeting; powerful individuals such as the Imam could turn a whole community against the `outsiders’ (A. Okello, field observations). The influence of Islam on Fulani identity is well documented in the literature (Azumah ; Riesman ). Despite having `so many ethnic groups’, participants overwhelmingly considered themselves to belong to only one; `the Fulfulde, joined by Islam’ (male FGD participant, aged 24). Religion, rather than state law, appears to play the most prominent governing role in social organisation, with `religious laws’ determining behaviour such as marriage, inheritance and daily prayer rituals. For example, selection of leaders such as the Ardos was done `according to our knowledge of the Qur'an’ (interview, Ardo ward 1). Celebration ceremonies appeared strongly based around the Islamic faith, such as Sallah (Eid al'Kabir) and various naming and wedding ceremonies. Consistent with Islam, there was no mention of `animistic’ harvest celebrations or similar events involving the livestock and environment which play such a major role in their lives. Any form of nbodoto (traditional beliefs or myths) was in fact vehemently denied; however, probing indicated that strong traditional practices - such as only travelling or visiting relatives on certain days of the week - may still exist. The Ardo'en held the main authority to develop and enforce informal laws to benefit those on the reserve. `Only the leaders design and give us the rules. Even us [males] - the leaders do not seek advice from us, even less from the women’ (male FGD participant, aged 26). Rules aiming to promote health and harmony on the reserve were the responsibility of the Ardo'en, for example where to graze cattle, where to fetch drinking water (`no-one should drink water from the same place as our cattle, it is not good for drinking by humans’), where their children play and even when people are allowed to leave the reserve; `if he says no-one is to go to the crossing [town], then no-one will go to the crossing’ (female FGD participant, aged 65). Ardo'en could also enforce rules regarding social interaction, particularly if it appeared to be detrimental to the wider community. `There is one game played during the night where one sees his colleague and he beats that colleague with a stick. The head of the village called the villagers to attention and gave them a law forbidding them to play that game’ (female FGD participant, aged 45). Regarding livestock health and husbandry, the Ardo'en, assisted by village elders, enforce a number of rules to minimise conflict in the event of livestock disease outbreak; `the head of the village will mobilise the people and tell them they shouldn't go close to that man's cattle, and people will listen to the rule, and they will not go closer’ (male FGD participant, aged 65). By all accounts, enforcement of rules and laws by community leaders seemed to occur relatively easily on the reserve, particularly regarding the younger generation; `we respect our leaders and we respect what they say to us and we follow rules - if a leader makes a rule no-body disobeys’ (male FGD participant, aged 24). When asked how they feel about the development and enforcement of various laws and rules on the reserve, responses were generally positive; `we feel happy, because when the rule comes, it works on us, it is for our own benefit’ (male FGD participant, aged 18). However, some older participants indicated that the `top-down’ informal governance structure of the KGR was possibly not enjoyed by everyone, despite decisions from the Ardo'en being largely obeyed; `because of the behaviour of our people, some people will start murmuring and arguing why they are prevented from going to such a place. So this is how our people are’ (male FGD participant, aged 72). Still others indicated that the enforcement of laws and rules was a necessary part of life, whatever the circumstance; `everywhere people are based, if they have their leaders, there will be laws’ (female FGD participant, aged 64). Since the establishment of KGR in the 1960s, the Fulani have relied heavily on their own organisation and inconsistent help from external donors and the Nigerian government to establish even basic infrastructure and systems of health and education. At the local government level, KGR is represented by a Ministry of Agriculture Kaduna State Development Project (KADP) Officer within the Kachia Local Government Authority (LGA). The KGR Project Officer was deemed the only `official’ link between reserve activities and official government policy processes, responsible for duties such as the registration and land allocation process for new families onto the reserve, and ensuring amenities are provided according to the Grazing Reserve Act. However, his presence appeared to be little felt by the majority of KGR residents, attributed by one male co-operative member to the `too much work he has’, likely reflecting a combination of poor resource availability and a tendency for `legal government business’ to generally be communicated by the Ardo'en. In this regard, male respondents indicated that there was some opportunity for input into government decisions. `We get the message easily through the mosque. When we get information about anything, we gather ourselves in one place and discuss the best way we can enlighten people’ (male FGD participant, 25 to 64 age group). The women however, barred from the mosque, appear to have little participation in how the messages get distributed and wider policy decisions made outside the reserve; `we have messages in the form of announcements that normally meet us through the Ardo'en’ (female FGD participant, 25 to 64 age group). Regarding livestock health services, opinions concerning the role of the state were forthcoming, particularly by the male participants, with many older respondents recalling the previous government-led vaccination programmes against harbin darji (blackleg), bakkale (brucellosis), bauru (foot-and-mouth disease), bushiya (rinderpest) and huhu (contagious bovine pleuropneumonia, CBPP) that occurred under `military rule’. Participants recalled how livestock disease outbreaks during this time were taken seriously by the government and met with swift responses. Currently, no state-sponsored animal health interventions exist on the reserve; when asked why these government programmes ceased, one response was simply `everything is about siasa (politics)’ (interview, male co-operative leader). Further probing revealed a perceived association between this change in government attitudes towards veterinary service provision and the democratic rule that took over from the military in 1999. `It was during the military regime that vaccination is taking place’they used to bring two or three vaccinations at the same time, they used to come quickly’ (informant interview, male co-operative leader). In actual fact, the decline in government-led veterinary services was due to structural adjustment policies in the 1980s that aimed to scale down government services and transfer responsibility to an unprepared private sector (de Haan ). Government respondents acknowledged the communication gap between the Fulani and state government that emerged as a result. `In the past we had national campaigns for disease control; there was a good relationship between Fulani and the government. Now, since structural adjustment, most of the free government programmes have collapsed - this leads to a widening gap between Fulani and government officials, as the government now has nothing to offer in terms of animal health services’ (interview, Plateau State Livestock Department). Other government opinions indicated a growing concern at the continually worsening health status of Fulani livestock herds, questioning the efficacy of `blanket’ vaccination programmes in the absence of a sustainable veterinary service. `Before you even vaccinate, you may have to think of deworming, you may have to treat for disease - the general health status of the herd is another problem’ (interview, Ministry of Agriculture, Federal Capital Territory). Regarding government-supported activities on the reserve outside of the livestock sector, polio vaccination remains the single major human health intervention, despite the occurrence of other communicable diseases such as measles (informant interview, KGR medical officer). Accounts from older Fulani recall times when emergency assistance would be provided by the government, for example during cholera outbreaks or times of famine, whilst more recent government activities have included grading the access road, and refugee assistance from the National Emergency Management Agency (NEMA) (Isuwa ). A recent synthesis of 21 cases in 17 countries concluded that formalised civil society organisations are a key factor promoting co-operation and common action of pastoralist societies (IUCN ). Discussions held with both the female and male leaders of the various co-operative groups on the KGR revealed little was known about the activities of the female groups by the men, and vice versa; the one exception being a previous joint HIV/AIDS enlightenment campaign led by an external non-government organisation (NGO). This example highlights the extent of the traditional gender segregation that still exists on the KGR, even for undertaking activities that would benefit the overall community such as health and education. Regarding participation in co-operative activities, whilst the majority of FGD respondents seemed aware of their existence, specific knowledge as to how the co-operatives operated was generally lacking, particularly within the younger age groups. Female co-operative groups exist on the reserve under the overarching co-operative group Mbigeweti (`now we are enlightened’), grouped according to their proximity to specific locations on the reserve: Wuro Nyako (House of Nyako), Wuro Fulbe, (House of Fulani), Mayo Borno (River Borno), Wuro Lobi (House of Lobi) and Wuro Tale (House of Tale). Formalisation of pastoralist co-operative groups via government registration is an essential driver for state recognition of activities, allowing greater co-operation with external agencies to improve their support networks (IUCN ). At the time of research however, only one of the womens' groups was registered with the government, seemingly as a result of cultural and logistical barriers impeding access of the female co-operative leaders to the formal processes required for registration. This in turn affects their ability to interact with outside funding groups which came onto the reserve; `they (the NGOs) came with their message but they didn't collaborate with us because we were not registered’ (informant interview, female co-operative leader). It appeared that the main activity undertaken by the female co-operatives was to advance credit to individuals wishing to start up or maintain business; however, the long-term impact of this remains unclear. Other activities undertaken include facilitating the production and sale of goods to sell at the market such as soap and chinchin (cakes). Another major role of the female co-operative groups was to promote education on the reserve, a fact mentioned favourably by FGD participants, regardless of age or gender; `the women are really trying [to ensure their children are educated]’ (male FGD participant, aged 65). Whilst male informants appeared not to object to the promotion of education, in general it was the women who played a pivotal role in ensuring it is achieved. `The society built this school that we are in now, and most of the teachers are paid for with our own money from this society. Our men here they don't pay for their school fees - if you want your children to go to school then you have to get money for their school fees yourself’ (informant interview, female co-operative leader). Interestingly, the women of KGR at the time of research did not have a milk society or group. This was surprising, given historical accounts from the literature describing the role of Fulani women in milk production and sale, often portrayed as the single activity allowing them some financial and social independence (for example de Bruijn ). The explanation by the women co-operative leaders for why there was no female milk society was that they felt it was not worth pursuing as a commodity; `if you are looking for milk in this place [within the reserve], you will get it’ (informant interview, female co-operative leader). Accounts from the more politically enlightened school teachers indicated that the historical opportunities for pastoralist women to access external dairy market chains were decreasing; `[nowadays] we really have a problem. As a Fulani community, [historically] most of our womens' business was selling milk, but now our women don't have an occupation that will sustain them’ (informant interview, teacher). Both males and females indicated that a combination of the KGR's isolation and poor road access is an obvious barrier to off-reserve sales opportunities. `We have so many problems. Some times when we make Kulikuli [groundnut cake] people are not buying it, because there are so many women that make it, and the times we do make it, we cannot take it out of this reserve because of the bad road’ (female FGD participant, 25 to 64 age group). Another important observation was the abundance of commercial powdered milk on the reserve, used by cafes and other small businesses as well as individual households (A. Okello, field observations). Likely as a result of the female co-operative groups not being officially recognised by the government, a recent World Bank-funded milk processing plant was controlled by the more powerful, politically connected male co-operative societies, further decreasing the opportunity for females to engage in dairy sector activity. `Like this building you see in front of you [milk processing room] we are the ones who brought it here. If it was not because of the [male] society, nobody would think of such an initiative’ (informant interview, male co-operative leader). There is an important requirement for further research into the current opportunities that exist for the inclusion of Nigeria's Fulani, both men and women, with formal dairy market chains in the north of the country, and the extent to which this is currently realised. Similar to the female Mbigeweti, the male co-operative groups fall under the `Nbela [umbrella] that acts like a mother to all societies’ (informant interview, male co-operative leader). In contrast to the female groups however, all male co-operative societies on the reserve were registered with the Nigerian government, thus allowing them greater political traction and the ability to liaise with outside funding groups. This has obviously given the male co-operative societies a distinct political advantage; they were the only homogenous group that indicated an understanding of, and participation in, formal government-led policy processes; `now we are in politics, and we have our ward councillor here. He represents us’ (informant interview, male co-operative leader). Reflecting recent findings in the literature (for example IUCN ), another participant reiterated that a strong co-operative is the only way to gain political voice and standing in local government: `If you are looking to be a councillor in this community, you will not win if you don't have a society’ (interview, male co-operative leader). Activities of the male co-operative groups included campaigning for the development of the Kachia access road, digging of wells and a number of agricultural initiatives including the planting of trees and procurement of livestock drugs and feed. Others indicated the relative ease with which the male co-operatives could obtain livestock inputs, particularly drugs, through a good relationship with the local government project officer. The recent acquisition of the aforementioned milk processing plant is an example of the extent of their influence; `we are the ones that fought for (the milk processor) in collaboration with KADP (Kaduna State Development Programme)’ (interview, male co-operative leader). Overall, the male co-operative groups appear quite powerful in terms of their bargaining power with the Kachia LGA, with several communication pathways between the Fulani and government authorities apparently available; `if something happens within our community we report to the district head. If it concerns the local government, we report to the (LGA) chairman. If it concerns (Kaduna) state we report to the governor. This is how our societies carry out their projects’ (interview, male co-operative leader). Through their external contacts and knowledge of local and state government policy processes, male co-operative members appear to have a much greater ability to influence the direction and enforcement of state government policies concerning specific pastoralist issues such as cattle, fertiliser, roads and water, compared to non-members. In contrast, the womens' co-operatives' sphere of influence was considerably smaller and less structured, consisting of localised village level activities directed at themselves and their children, rather than an attempt to gain official recognition from the state and/or donors. The teachers were the only other participant group who indicated an understanding of higher level political processes, describing how the National Union of Teachers provided information on current policy debates within government. These groups were the exception; more often than not, respondents indicated that messages from the local government were delivered via their Ardo'en, thus indicating little direct participation in government policy or other decisions made outside the reserve. Working with the co-operative groups will be central to strengthening future Fulani-government relations. The male co-operatives are a key stakeholder group regarding the livestock sector and potential development of private sector veterinary services on the reserve. Similarly, respondents from across all FGD ages and genders appreciated the important role of the women in promoting education and health messaging on the KGR. The major barrier to progress on the latter, however, remains the lack of knowledge of and access to the registration process for the female co-operatives. Unless the number of registered female co-operative groups on KGR increases, there is a chance that issues of particular concern to the KGR female community members, such as education and maternal and child health, will be left out of subsequent dialogue. The political pressure resulting from networks, alliances and co-operation with external actors helps create wider change in pastoralist societies, with the associated capacity building, awareness raising and economic support `allowing for parallel, synchronised actions in an entire region’ (IUCN ). NGOs such as Pastoral Resolve (PARE) were mentioned by interview respondents mainly in the areas of health, predominantly promoting messages around sanitation (boiling and sieving water, hand-washing) and HIV/AIDS advocacy. Whilst communication between the Fulani and NGOs and other development organisations that came onto the reserve could not occur without prior permission from the Ardo, once permission was sought, the messages seemed to flow quite well amongst the communities; `the head of the village will assign people to go to the neighbouring villages and inform them of what is happening’ (male FGD participant, 25 to 64 age group). The group of older females (65 years and over) appeared most knowledgeable of the various NGO interventions and their impact; `that was when we started boiling our water and this has made a very good impact on us. Before we never used to boil the water, we used to drink it directly from the well’ (female FGD participant, 65 years). For younger age groups, the NGO sector did not appear to play a prominent role on the KGR at the time of research, with many unsure of the various organisations, suggesting that in recent times the input from NGOs had diminished; `there was a time we were enlightened by other people about HIV/AIDS....and there are other NGOs similar....but we can't differentiate between them’ (informant interview, teacher aged 24). In terms of broader alliances promoting the welfare and socio-political power of Fulani pastoralists in the wider region, Miyetti Allah (literally `thanks be to God’) is a religious organisation formed in 1972 to represent Fulani interests in official government circles, with a major objective to improve access to grazing land. Out of all the respondents however, only the younger female focus group (10 to 24 years) made a specific mention of what is now termed the Miyetti Allah Cattle Breeders Association of Nigeria (MACBAN), which has extensive branches across northern Nigeria (Kaufmann et al. ). References in the literature to Miyetti Allah are sparse; however, accounts from the 1980s are contradictory, with one author praising the organisation's achievements at higher government levels (Ezeomah ), whilst another claimed Miyetti Allah had `no authority’ (Kaufmann et al. ). Poor organisational leadership during the last decade has further contributed to MACBAN's lack of influence in the policy process, leading to pastoralists `questioning the relevance’ of such institutions for the protection of their rights (Ibrahim ). The relationships and overlaps between these various institutions can be represented in a Venn diagram (Figure 1). 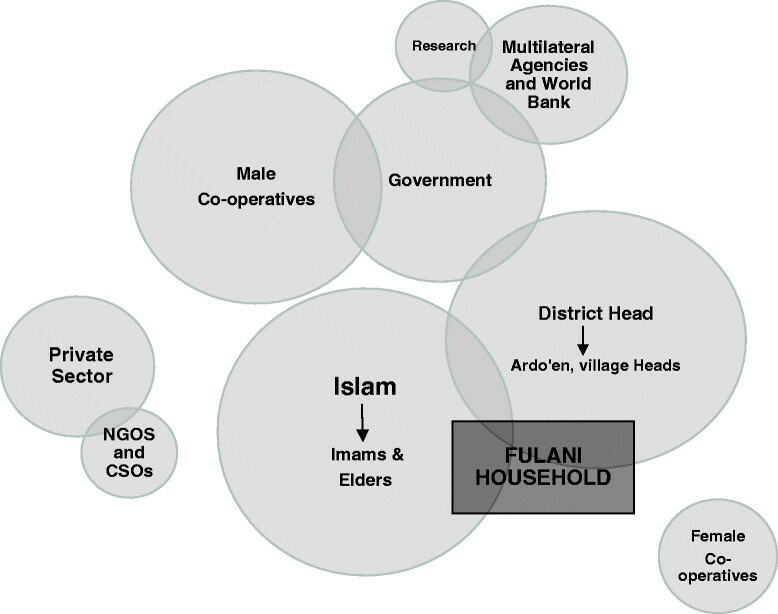 Venn diagram illustrating the relative stake of various actors within the Fulani governance system on KGR. The evidence from this research accords with various descriptions from literature sources, whereby identifiable community leaders have strong decision-making authority in Fulani society (Azarya ; Iro ). There were several indications that the KGR governance structure recoded in this research agrees with documented accounts of the role of the Ardo'en as mediators between the Fulani and the `formal law’ of the official government (for example Riesman ; Iro ), in this case the ward heads of the six blocks and often the leaders of the male co-operative societies. Many indicated that the state government enforced `no rules at all’; although this is a common observation across Nigeria (and indeed much of sub-Saharan Africa) due to the generally poor enforcement of livestock policy, this could also reflect Fulani feelings of isolation from official government policy processes. Given the central role of cattle to Fulani society, it is perhaps unsurprising that informal governance mechanisms appear to be heavily focused around overseeing informal `policies’ regarding livestock practices, for example the issuance and enforcement of animal quarantine after off-reserve grazing during the dry season. `Here in Ladduga if your cattle are infected with a disease you cannot hide it. You can ask people for help, but if the infection rate is high you will be given a rule to restrict your animal from grazing where the other animals are’ (informant interview, Ardo, ward 2). Another added `There is not any government law about how to handle our cattle. We make laws on our own, we gather ourselves together and tell our neighbouring villages those with infected cattle should be grazing on their side, they should not come to our side’ (male FGD participant, 25 to 64 age group). Participants also described various vaccination programmes that were organised and paid for collectively by the Fulani to promote disease control and good animal husbandry. Accounts from outside the reserve reinforce the existence of these well-enforced, self-imposed preventive measures such as quarantine for disease control in Fulani society; for example, one government official spoke of his experiences further south in Oyo State where the Fulani had formed a committee preventing others coming from the north onto their grazing reserve due to fear of disease introduction (informant interview, Plateau State Livestock Department). Professional frustration over certain actions of the Fulani regarding the health and management of their livestock was expressed by both public and private actors alike, for example under-dosing of cattle therapeutics `to try to ration (the drug) for their whole herd’ (informant interview, private veterinary sector). However, the Fulani perspective implies these types of actions are not necessarily driven by economics and lack of willingness to pay for services, but a combination of poor access to livestock inputs, compounded by a lack of knowledge; `if you see your animals are in an emergency condition, you go and buy [drugs] yourself, you cannot wait for anybody to come and do it for you’ (interview, male co-operative leader Hamri Halal commercial farmer co-operative group). Another explained `you are supposed to know which type of drug to give the animal even if you don't know what the animal is suffering from! So we are facing this problem’ (male FGD participant, 25 to 64 age group). Overall, contrary to the assumption that the Fulani do not want to invest in veterinary services - `they are aware of the vet facilities but they don't use them’ (informant interview, private veterinary sector, Kaduna State) - disease control is an extremely high priority to the Fulani, indicated by the far-reaching social repercussions of sick animals; `cattle disease causes fights between people’ (male FGD participant, aged 12). Several government officials acknowledged that reinvigoration of the government extension system could help improve Fulani-government relations through alleviating miscommunications from both sides. Extension services have currently collapsed across many parts of Nigeria, particularly in pastoralist areas. This is blamed on the expense and logistics of maintaining constant contact with isolated communities such as those on the reserve (informant interview, Plateau State government). Nevertheless, the extension service is regarded as an integral component of successful implementation of disease surveillance and reporting policies and improvement of government-Fulani relations in Nigeria `because that's what leads to communication with these Fulani, not this once in a year communication’ (informant interview, Ministry of Agriculture, Federal Capital Territory). However, simply improving extension services will not alleviate the current issues regarding lack of private good services such as drug provision and disease diagnostic tools; if the Fulani cannot understand why immediate problems of sick animals cannot be addressed by extension agents, it will only lead to further lack of trust and confidence in the government. Comparison of opinions from the KGR Fulani communities and those from members of local and state government suggests a disconnect between what the Fulani want and what the Nigerian government assumes they want. Examples regarding livestock service provision were key observations in this regard, with some, particularly older, government officials feeling that the Fulani are not willing to pay for veterinary services and do not take responsibility for their livestock husbandry and treatment. `They prefer to observe vets, then self-treat. They are aware of the vet facilities but don't use them. Their knowledge is more of a barrier than otherwise. Training them may make it worse’ (interview, Plateau State Veterinary Hospital). Although some older Fulani (likely those that remembered the pre-structural adjustment era) appeared to believe that the government would eventually resume its free veterinary service, things are obviously changing with the younger generation. When asked what government support and services they would like on the reserve, animal health was not mentioned; overwhelmingly, the Fulani's priority expectation from the government was the provision of water and roads, which is indeed a government responsibility on a gazetted reserve according to the Grazing Reserve Act of 1964 (Kaufmann et al. ). In terms of livestock service provision, the majority of respondents indicated a willingness to pay for veterinary drugs and services from private providers. However, given the limited private sector activity currently existing on the reserve, many Fulani had to travel to buy drugs, for example a veterinarian at Zankwa (Kaduna, outside the reserve) was mentioned by several respondents. Aside from the issues with accessibility to veterinary services, the quality of available inputs was also questionable; `sometimes when we buy medicine and inject our cattle, it's as if we increase the sickness. If you are lucky your animal gets well, and for some sickness there will be no response from the drugs. That is why we listen to information that is passed on to us’ (male FGD participant, 25 to 64 age group). Younger government officials supported the opinion that the Fulani are happy to pay for veterinary services, provided they are easily accessible and the quality is there: `I think [the Fulani] have gone beyond expecting free veterinary services....the only thing that keeps the Fulani man, or anybody, is a quality service. For example, if before the Fulani man has even showed you his animals you are getting out drugs, calculating money - that is the wrong approach. Instead, if you take the cow's blood, and right there you do a blood smear and tell him "come and see the trypanosomes" that Fulani man cannot go to sleep! He will ask "you mean this thing is in my cow, destroying the blood?" and he will ask you to give him the solution to kill the parasite. It's all about communication’ (informant interview, Ministry of Agriculture, Federal Capital Territory). The importance of effective communication in veterinary service provision in Nigeria - `especially when government agencies are dealing with people who have had only tenuous relations with them’ - has been acknowledged for decades (Awogbade ). Notwithstanding the inherent logistical difficulties of long-term engagement with transhumant and nomadic societies, meaningful contact with the Fulani is vital to gain their trust and confidence, contributing to the development of sustainable pastoralist-government relationships. As one government official reiterated `You get that confidence [with the Fulani] through continuous contact, not periodic or haphazard contact. If you don't develop that confidence there's going to be a problem’ (informant interview, Ministry of Agriculture, Federal Capital Territory). As this research demonstrates, the lack of joined-up communication between the Fulani and veterinary actors (public and private) is an important contributing factor to existing pastoralist-government tensions. The private sector in particular should be encouraged to fill the existing gap in veterinary service provision, with the opportunities to do so identified, supported and promoted amongst veterinary workers both during and after training. Several government respondents agreed `There exists a requirement to open the eyes of Animal Health Technicians and show them they can make a living in rural areas, especially if their animal health knowledge is combined with husbandry services. For example the vets had a good response from Newcastle Disease vaccination in conjunction with the HPAI [Highly Pathogenic Avian Influenza] vaccination programme, as it sensitised the public about holistic poultry care and disease control. If the same can be done by animal health technicians I am confident they will gain public confidence’ (interview, Plateau State government). Given the priority the Fulani place on their livestock, improved access to livestock inputs and information should be considered a key entry point for improving Fulani-government relations; however, it will require demonstrated commitment, understanding and facilitation from both sides. The primary objective of this research was to understand the existing self-governance structures in Nigeria's KGR, in order to identify motivators and entry points for Fulani-government dialogue. The results are timely, given the recent move by several African governments to reinvigorate policy initiatives aimed towards addressing pastoralist issues on the continent, including the 2011 African Union Policy Framework for Pastoralists in Africa and the 2013 Nouakchott Declaration. The long history of conflict and mistrust between external actors and Nigeria's pastoralist Fulani, compounded by physical isolation and changing state policy narratives regarding their role in society, appears to have resulted in a complex but functional system of self-governance outside formal government policy, particularly regarding livestock disease control. The empirical evidence described in this article concurs with several earlier publications highlighting Fulani self-governance systems that arise in the absence of external inputs from the state (Riesman ; Azarya ; de Bruijn ). This existing Fulani self-governance system must be well understood if ongoing approaches towards increased political inclusion, improved service provision and conflict resolution are to be successful. It is urgently important to understand and integrate, rather than isolate, the self-organising systems of Nigeria's Fulani pastoralists in order to identify workable solutions to pastoralist needs; witness the growing conflict in the north of Nigeria over the past two decades. The provision of veterinary services appears to be a plausible entry point for the reinvigoration of Fulani-government relations, since the decline of government-funded livestock disease control programmes is considered by state and Fulani respondents alike to be a major blow to trust and communication on both sides. Reinvigorating Fulani-government relationships by strengthening veterinary services and promoting `enabling’ policies to encourage private sector investment in the veterinary/livestock sectors could start to generate the trust and dialogue required to provide public good amenities such as roads, water and human health. This research demonstrates that whilst the Fulani seem open to participation in formal policy processes and government service provision, the opportunity rarely arises, and when it does, it appears to be met with a general misunderstanding of expectations from both sides. There are already heightened tensions across northern Nigeria. Improving the communication pathways in order to avoid further misunderstandings between the Fulani and the public and private sector actors they integrate with should be a priority for all involved in promoting peace and stability in the region. ALO is a veterinarian with a PhD in political science from the University of Edinburgh, working to promote transdisciplinary approaches for zoonotic disease control in Africa and Asia. AOM is an epidemiologist at the University of Edinburgh, working on the control of parasitic and zoonotic diseases. AM is a researcher with the Nigerian Institute of Trypanosomiasis Research, based in Kaduna State, Nigeria. SCW is the Director of the Global Health Academy and Assistant Principal for Global Health at the University of Edinburgh. JS is a professor of African and Development Studies and Assistant Principal of the Global Development Academy at the University of Edinburgh. The authors would like to thank all the people who gave their time, opinions and sentiments during the course of the study, in particular the members of the Fulani community on Kachia Grazing Reserve, and those interviewed in the relevant government, private and research sectors. The authors would also like to thank the Nigerian Institute of Trypanosomiasis Research (NITR) and the National Veterinary Research Institute (NVRI) for facilitating the research. This study was supported by the UK's Biotechnology and Biological Sciences Research Council (BBSRC) under the `Combating Infectious Diseases in Livestock for International Development’ (CIDLID) scheme (AOM, SCW), the European Union's Seventh Framework Programme (FP7/2007-2013) under grant agreement no. 221948, Integrated Control of Neglected Zoonoses (ICONZ) (ALO, AM, SCW), and a European Science Foundation Senior investigator(s) award Investigating Networks of Zoonosis Innovation (INZI), grant number 295845 (JS). ALO, AOM, SCW and JS designed the study. ALO, AOM and AM undertook the fieldwork. ALO and AM interpreted the data, and ALO drafted the original manuscript, with further inputs from AOM, AM, SCW and JS. All authors read and approved the final manuscript. HRW. 2001. Jos: A city torn apart. Human Rights Watch Reports 13(9). . Accessed 23 April 2014., [http://hrw.org/reports/2001/nigeria] HRW. 2001. Jos: A city torn apart. Human Rights Watch Reports 13(9). . Accessed 23 April 2014. Isuwa, S. 2014. NEMA donates relief materials in Kachia. Weekly Trust. ., [http://www.dailytrust.com.ng/weekly/index.php/new-news/16553-nema-donates-relief-materials-in-kachia] Isuwa, S. 2014. NEMA donates relief materials in Kachia. Weekly Trust. .